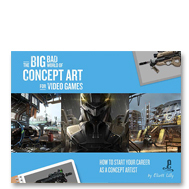 Are you ready to begin your career as a concept artist in the video game industry but don't know where to start? The Big Bad World of Concept Art for Video Games: How to Start Your Career as a Concept Artist is book two in the Big Bad series, delving deeper into the subjects and topics explored previously in An Insider's Guide for Students. Going beyond the amateur level, this guide prepares the upcoming professional, or any other artist, for a future in the entertainment industry. Whether you are a graduating student joining the workforce, a young professional who has just broken into the job market, or even an existing professional frustrated with your current situation, receive help figuring out what comes next for a fulfilling career. Eliott Lilly is a highly sought-after concept artist with over a decade of experience in the video game industry. He has worked for such prominent game companies as id Software, Treyarch, and Activision. He has contributed to several popular franchises, including Rage, Doom, and Call of Duty. Also an educator, Eliott teaches introductory concept art classes to university students. With his firsthand knowledge of the ins and outs of the video game industry, Eliott Lilly is an exceptional guide who can help prepare you for the rewarding journey toward realizing your ambitions. Categories: Books, educational. Tag: eliott lilly. Do you dream of becoming a concept artist in the video game industry but don't know where to start? 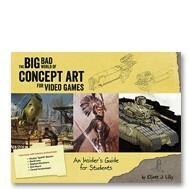 The Big Bad World of Concept Art for Video Games: An Insider's Guide for Beginners gives aspiring artists an honest, informative, and entertaining look at what it takes to do just that. Author Eliott Lilly will help you on your journey from finding the right school and how to get the most out of your education, to preparing your portfolio to land that first job. In addition, renowned concept artists—David Levy, Sparth, Stephan Martiniere, Ben Mauro, and Farzad Varahramyan—share their own dos and don'ts to making a career in the video game industry a reality.